1. 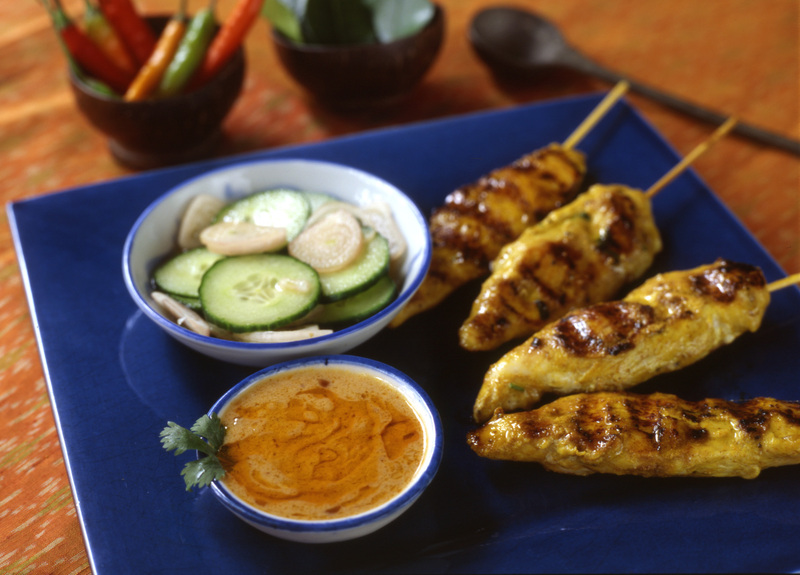 Chicken Satay (Grilled Curried Chicken on Skewer with Peanut Sauce & Cucumber Salad). 2. Shrimp Satay (Grilled Spicy Shrimp on Skewer with Peanut Sauce & Cucumber Salad). 3. Moo Yang Takrai (Grilled Lemongrass Pork on Lemongrass Stalks with Plum Sauce). 4. Goong Kratiem Prig Thai (Garlic & Pepper Prawns with Fried Garlic & Cilantro). 5. Tod Man Pla (Thai Fish Cake with Cucumber Salad & Sweet Chili Sauce). 6. Miang Kam (Wild Pepper Leaf Wrapped Tidbits, Toasted Coconut Chips, Nuts, Herbs with Gingerly Savory & Sweet Sauce). 7. Gari Puff (Puff Pastry with Chicken & Onion Curry Filling with Cucumber Salad). 9. Gai Hua Bai Toey (Pandan Leaf Wrapped Chicken with Sesame-Soy Dipping sauce). 10. Mar Hor (Galloping Horses, Tidbits of Savory Pork & Ground Peanuts on Pineapple). 11. Saku Sai Moo (Tapioca Dumplings with Savory Pork Filling with Spicy Chili Sauce). 1. Tom Yum Goong (Thai Sweet & Sour Prawn Soup with Kaffir Lime Leaf). 2. 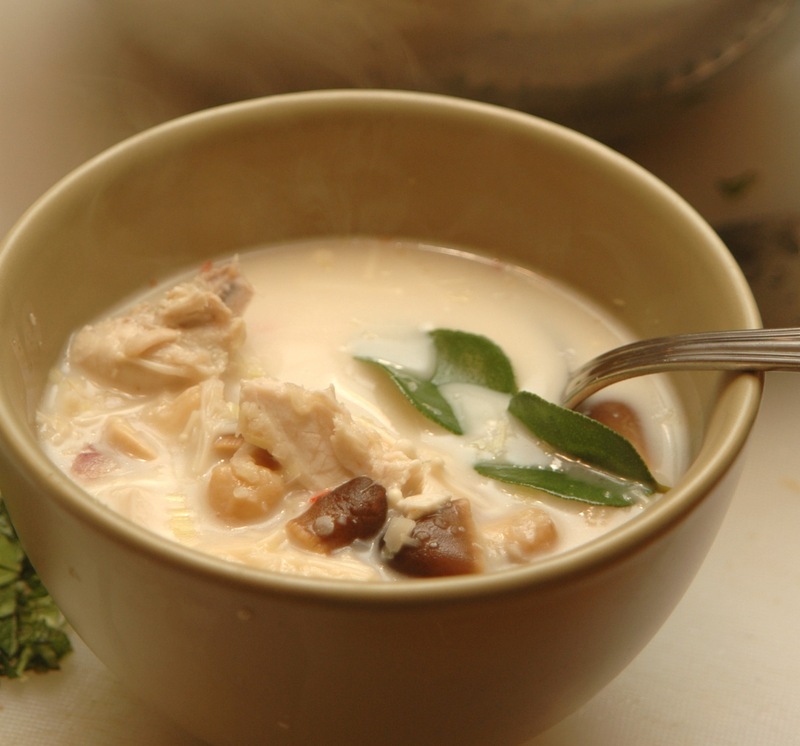 Tom Kha Gai (Galangal Coconut Milk Soup with Kaffir Lime Leaf & Lemongrass). 3. Pho Tek(Seafood Stew with Kaffir Lime Leaf, Lemongrass & Galangal). 4. Tom Sap (Beef Soup with fiercely Hot & Sour Soup Sawtooth Herb, Vietnamese Mint, Kaffir Lime Leaf, Lemongrass & Galangal). 5. Tom Khamin Pla Salmon (Southern Thai Turmic Sweet & Sour Soup with Salmon). 6. Gaeng Jued Woon Sen (Prawn & Pork Cellophane Noodle Soup with Napa Cabbage). 7. Gaeng Leang (Kabocha Pumpkin Soup with Prawn & Lemon Basils). 1. Yum Neua (sliced grilled beef sirloin steak with mint, toasted rice powder, lemongrass, galangal, scallion and lime juice). 2. Laab Gai (cooked minced chicken tossed in mint, toasted rice powder, chili powder, lemongrass, galangal, scallions, fish sauce and lime juice). 3. Pla Goong (shrimp cocktail in spear mint, Thai chili, lemongrass, galangal, scallion lime juice and fish sauce). 4. Yum Woon Sen (shrimp or calamari salad with cellophane noodles, ground peanuts, minced pork, pickled garlic, fish sauce, lime juice and fresh herbs). 5. Som Tum(green papaya or carrot salad, julienned papaya mix with peanuts, garlic, fish sauce and palm sugar). 6. Yum Pla Muk(calamari salad with green onion, cilantro, Chinese celery, Thai chili powder, fish sauce and lime juice). 7. Yum Pla Dook Foo (crispy pan-fried catfish served with mango, shallots and lime salsa on top). 9. Por Pia Sod (Fresh summer rolls: rice paper roll with soft tofu, cooked shrimp or halibut cheek, jicama and topped with cilantro, fried garlic and sweet and sour sauce). 10. Yum Som Oh (Thai Grape Fruit Salad w/ Grilled Prawn, Tamarind Dressing & Fried Shallot). 11. Yum Gai Med Manuang (Chicken Mango Salad with Cashew Nut & Cherry tomatoes). 12. Yum Makrua Yao (Grilled Eggplant Salad with Lime Dressing Topped with Fried Shallot & Thai Herbs, Prawn, Pork or Chicken). 3. Chu Chi Goong (Tiger Prawns in Chu Chi Curry with chiffonade Kaffir Lime Leaf). 4. Gaeng Massaman (beef or chicken in a mild Massaman curry with peanuts, potatoes and onions). 5. Gaeng Gari (Gari curry with beef or chicken in a mild yellow curry with onion and potato). 6. Gaeng Keow Wan (beef, chicken, halibut, salmon, prawns or scallops in green curry with Thai eggplants and basil leaf). 7. Gaeng Phed Daeng (red curry with chicken, prawn or duck with choice of bamboo shoots, zucchini, Thai basil and Thai eggplants or seasonal vegetables). 8. Phad Phed Pla Muk (pan-fried calamari with red curry, long beans and cilantro). 9. Gaeng Phed Ped Yang (roasted duck red curry with Thai eggplant, cherry tomatoes and basil leaf). 10. Geang Keu Sapparod (shrimps in Phuket red curry with ground peanuts and pineapple). 11. Khanom Jean Pla Salmon (salmon poached in lemongrass and turmeric curry served with rice vermicelli). 12. Phad Phrik Khing (Pork, Chicken or Prawn Stir-fried with Phrik Khing Curry Paste, Snaked Beans and Kaffir lime leaf). 13. Pla Jian (Pan-fried Fish with Crispy Ginger-Lemongrass-Garlic in Yellow Bean and Tamarind Sauce). 14. Goong Phad Nam Ma Kam (Large Prawns in Sweet and Sour Tamarind Sauce with Fried Shallot & Cilantro). 15. Pla Rad Prik (Pan-fried sea bass or trout topped with pineapple, chili, garlic and fish sauce). 16. Goong Oob Woon Sen (Aromatic Prawn Baked in Clay Pot with Chinese Spices & Thai Herbs, Cellophane Noodles & Soy Sauce). 17. Planueng Ma Now (Lemongrass Steamed Salmon in Delectable Sauce). 18. Sai Uah (Northern Style Curry Sausage with Thai Spices, Lime Leaf & lemongrass). 19. Phad Phed Pla Dook (Fried Firm Fish Stir-fried with Red Curry Paste, Green Peppercorn, Lesser Gingert, Topped with Crispy Basil & Kaffir Lime Leaf). 20. Phad Kaprow Khai Dao (Stir-fried Minced chicken with Holy basil, Garlic and Thai Chili served with Fried Egg). 1. Phad Thai (Stir-fried Prawn & Rice Noodles Stir-fried in Phad Thai Sauce & Garlic Chive). 3. Rad Nah (Pan-fried Fresh Rice Noodles or Crispy Egg Noodles Topped with Chinese Broccoli , Fermented Soy Bean & Gravy with Pork, Chicken or Prawn). 4. Kao Soi (Chiang Mai Chicken Curry served with Egg Noodles & Assorted Condiment). 6. Guay Tiew Rua Neau (Rice Noodles with Tender Beef, Bean Sprout, fresh basil, cilantro, Chinese celery, fried garlic and green onion in Delectable Broth). 7. Tom Yum Moo Sap (Sweet & Sour Noodles Soup with Ground Meat, Bean Sprout & Cilantro). 1. Koa Neo Dam (Black Rice Pudding with Warm Coconut Milk). 2. Saku Peak (Tapioca Pearl with Taro, Young Coconut in Sweet Coconut Milk). 3. Kluey Bud Chee (Sweet Fragrant Banana in Coconut Milk). 4. Kha Nom Saku (Sticky Coconut Covered Rice Ball with Melted Palm Sugar Inside). 6. 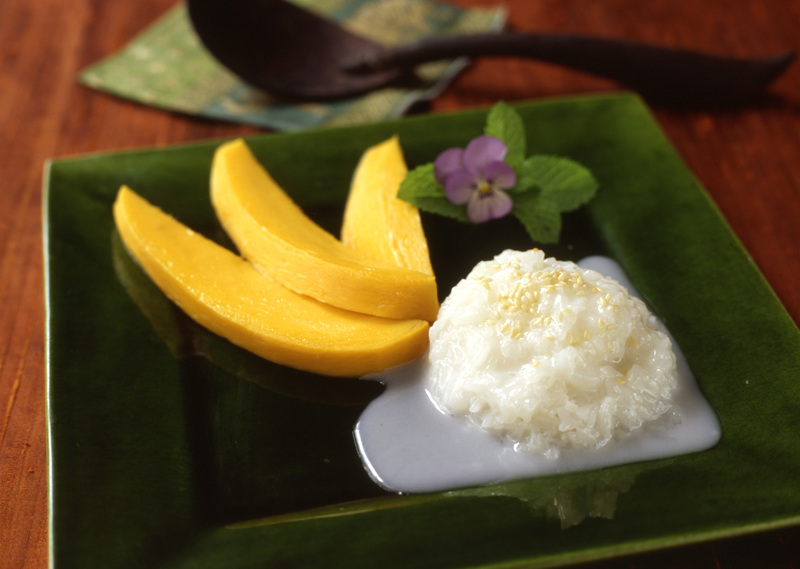 Kao Neow Mamuang (Mango with Sweet sticky rice).